We’ve been taking Muni to Japanese class on Sundays ever since the big bike breakdown during Pride. I had ambitions to ride this week, but the MinUte went to the shop for a derailleur adjustment yesterday (and I’ve been encouraged not to carry heavy loads like my son on the Breezer anymore). Muni is a convenient ride usually, but the N-Judah streetcar is closed for construction for much of the summer, including this weekend. The alternate routes are not so great. We took the bus to class on Sunday, but as usual, it took 20 minutes more than the N-Judah, I had to carry my son through much of the Financial District, he was exhausted by the time we arrived, and we ended up getting to class late anyway. 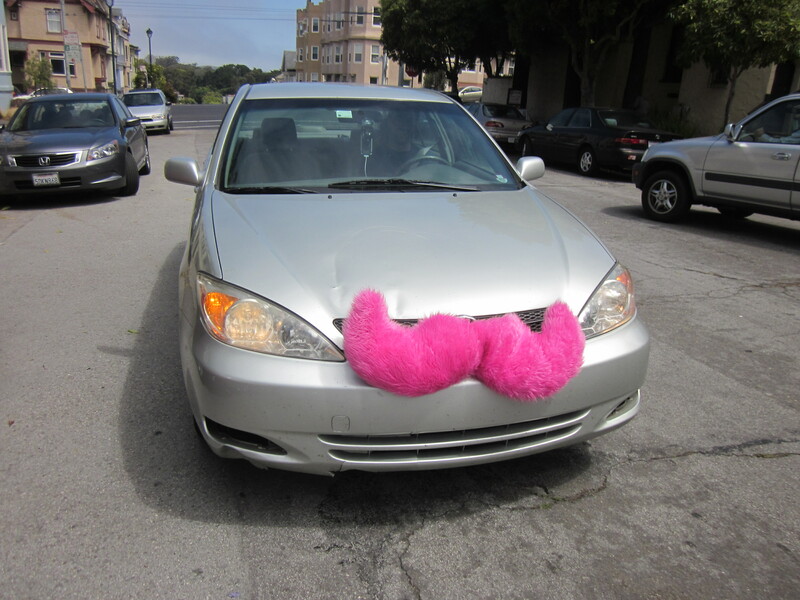 These fluffy pink mustaches identify Lyft cars, evidently. 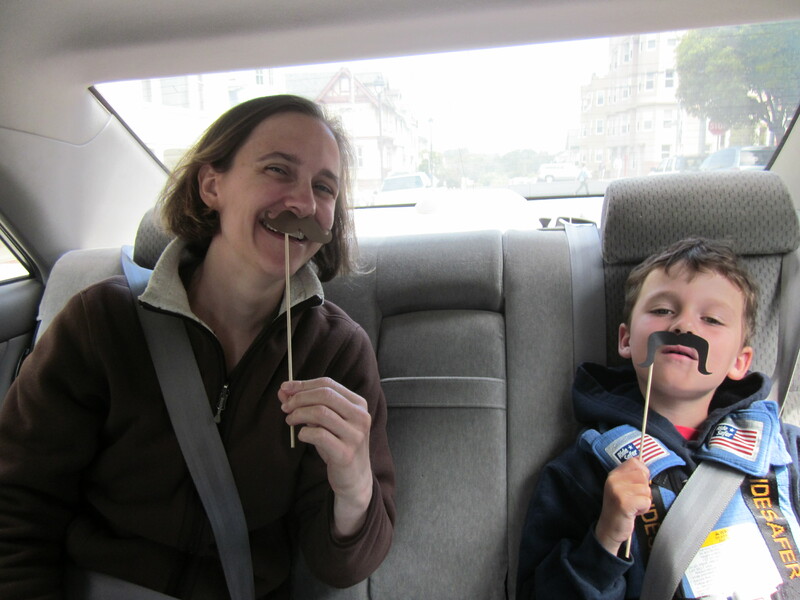 Sam, it turns out, moved to San Francisco last month from Oklahoma and is currently driving for Lyft as his full-time job. I was impressed that it was possible for him to make a decent living in a new city immediately upon arrival. Personally I wouldn’t have chosen a stick shift for driving around the city, and he says his leg gets pretty tired at the end of the day, but I assume it’s flatter in Oklahoma. He said that San Francisco was full of the nicest people he’d ever met, and I agree: I have lived in many cities (Boston, Chicago, Munich, Paris, Seattle, Minneapolis-St.Paul, etc.) and although the Twin Cities had a lot of Minnesota-nice, on most days San Francisco is the friendliest place I’ve ever been. Sam was a nice guy himself and a decent driver. He wants to keep driving even after getting a traditional office job, so if you call, maybe you can get a ride from him too. Post-ride mustachioed photos are nearly obligatory. But: unbeatable value! Homobiles, at $1/minute, would have worked out to ~$20 (plus tip). Sidecar suggested a donation of $22, had a driver been available, for the same trip in reverse. A taxi ride for would be $32 (plus tip) according to the online fare calculator, assuming we could have found one, which is unlikely. Muni fare is a much more economical $2.75 for adult+child, but would have taken an extra half hour. Lyft’s charge for the same ride turned out, once we’d arrived, to be $12 (plus tip). Sold! When we got home Matt said, “You’re back early! You must have gotten a ride back.” Yes we did. And I don’t doubt we’ll be getting occasional rides from Lyft again. I am confused. First you said Lyft was exorbitant and you would not use them again, then you show the price is the cheapest and you would use them again? he said “if” before that statement. read. ugh! Why do people have to be such goofs when it come to just writing the facts.. “the cost turned out to be affordable for me”? I know why, cause it gets me and a bunch of grammar police to post what we know is absolutely wrong and would only be right if it weren’t so wrong.